Glenn Jensen, a forklift operator at Southern States off Alverser Drive in Midlothian, with a badass Stihl chain saw. No, you can't be some wussy pants and shop at the old farmer's cooperative that first started in Richmond in 1926. It also sells Mole Max and traps for raccoons and possums. Want to keep the critters out of your garden? Pick up a bottle of bobcat urine or fox urine, from Leg Up Enterprises. Try finding that at the Great Big Greenhouse. Need a new leaf blower, or a chain saw? 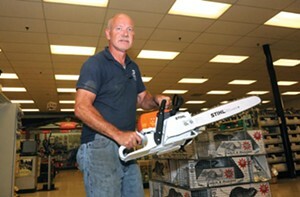 Southern States sells only the manliest brands, like Husqvarna and Stihl. Yes, they did have those cute little chicks earlier this spring, in time for Easter, and women do like buying flowers there. But don't mind the ladies. On your way out pick up a 40-pound bag of deer corn, in the camouflage packaging. That's right, real men try to lure deer into their yards and dare them to start munching the cucumbers in the garden.